It has been one heck of a busy week. What with the most exciting Inauguration of a President in my lifetime (and the parties that went along with it), and working to fight off the threat of a mean-spirited English-only charter amendment here in Nashville (we won! ), I have been running non-stop. But I managed to cook a few meals that I think are worthy of posting. One of them was this hearty dish of polenta, kale and sausage. Polenta is a staple in Italian homes, mostly in the North where the people are affectionatly referred to as "Polentoni." Polenta is Italy's "other pasta," and in some regions like the Veneto or Friuli, it is even more common than pasta or risotto. Roman soldiers ate it for sustenance on the go when it was made from a primitive form or wheat or ground chickpeas. It was not until after 1492 that it was made with corn, one of the most recognizable ingredients in Italian cooking (like tomatoes) brought to Italy from the "new" World. I find it still has that heartiness, that thick, porridge-like consistency that makes you feel somehow more primitive when you eat it. It warms the body, not only as you eat it, but as it is being cooked over the fire while stirring often. I can just see those robust northern Italian women standing over a copper cauldron at the hearth, stirring with a big medieval wooden club. I make mine using Bob's Red Mill brand polenta that you can find at most stores and follow the recipe on the bag which is pretty traditional: boil water, add polenta in a slow, steady stream, add salt and stir for about 20 min. Add 2 T butter, parmigiano cheese if desired, and serve. Anson Mills also makes a wonderful "artisan fine polenta" that I've been meaning to order, but I'm not much of a mail-order person. I like to shop locally but this is a business I really would like to support. Just pile some sautéed kale on top of the polenta, maybe some carmelized onions and a grilled sausage on top (or not) and you've got a beautiful winter dish that can stand on its own. Served with an inexpensive glass of red wine, it's what I call a recession-proof meal. What happens when you haven't gone to the store in a while, you don't feel like a big, complicated meal and your football team just lost the game that would have taken them to the championships? You make pizza! What better way to cheer up than getting in the kitchen together, making the dough from scratch, watching it rise, rolling the dough out and letting everyone top their own pizzas. A few minutes in the oven and it's done! When we make pizza at my house we sit around the kitchen --preferably on a cold night for the oven is on high for a while--and make and eat them as they come out of the oven. My recipe for dough is an easy one. It was given to me by my good friend, Silvia, from Varese, Italy. She now lives in Florida but I know she and her family make this pizza recipe all the time. And I know why --it truly is easy and fast. 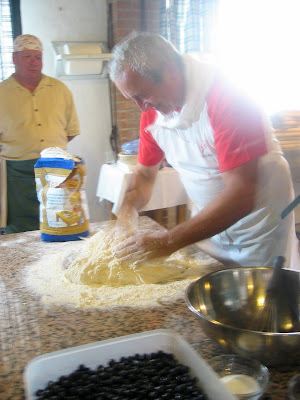 When I was in Italy I learned how to make pizza dough from a real 'pizzaiolo' whose name was Aldo. His pizzas were perfection. But we also had better flour, a perfect temperature and wood-fired ovens. 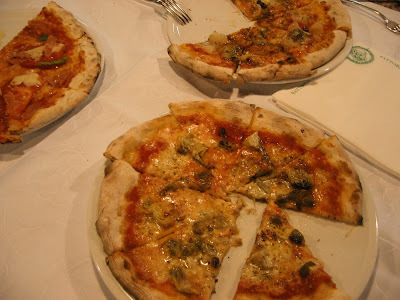 If you are really serious about making authentic pizzas, there is no other way but to cough up the dough (pun intended) and get yourself a wood-burning oven. But I find that using my old electric one, on about 500 degrees with a pizza stone which is key, works pretty well. And it definitely beats the American-style doughy, tasteless pizza that comes to your door in a box. I will name no names. I use my Kitchen Aid mixer for this with the dough hook because it's faster. Or the the cuisinart. But in Italy, of course, we used our hands. First, activate your yeast by stirring it in a little bit of warm tap water. Then combine flour and salt in mixer, then add yeast and mix. 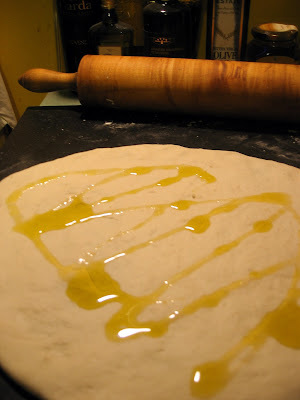 Add 2 T olive oil and the 1 cup of water and mix until dough comes together wrapped around the dough hook. Place dough in a bowl covered with a clean towel and let rise in a warm, dry place for at least a half-hour. One hour is usually more than enough. It should double in size. Makes two medium pizzas. When ready to go, divide dough in half and roll out on a smooth, lightly floured surface. Drizzle olive oil on top before adding toppings. Also, if you have one, use a pizza peel with some semolina flour sprinkled on top to get your pizzas in and out of the oven. The semolina really keeps it from sticking. Oh, and use homemade tomato sauce or a good quality store bought version. 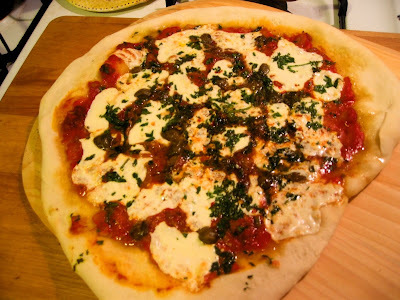 *(combine anchovies and capers with lemon juice and olive oil, then add chopped parsley and pour marinade over tomatoes and mozzarella before baking). 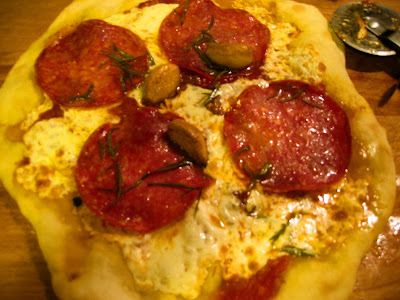 Making pizza is also a great way to fight off the winter blues. 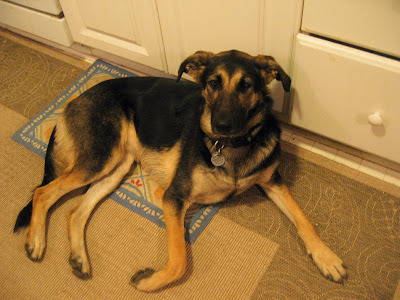 Or, if your heater is broken like ours was recently and you need to warm up the house. Or, have a party, invite your friends and let everyone make their own. It's the new fondue party. There is nothing quite like the perfect sandwich cookie. You can smear a bunch of things between two cookies and call it good, but in reality, not all sandwich cookies are created equal. Think of the oreo. It's an insult to the sandwich cookie if you think about it. Like the famous linzer cookie with its heart-shaped cut-out reminiscent of the holidays. Those are pretty darn perfect. And the cookie in question: two buttery, nutty shortbread cookies with tart berry jam in between, dusted with powdered sugar. mmmmmm. I am a fan of this cookie recipe, not only because it looks so pretty, dusted as it is with powdered sugar as if to say 'this was just an after-thought, nothing more, nothing less' but because it is such an easy recipe. If you have a food processor or nut grinder for the walnuts, even better. But if not, finely chopping the walnuts is the hardest thing you'll have to do. I served them as a simple ending to a holiday meal. It was a Hanukkah dinner I gave for my b.f.'s family. I made potato latkes and topped them with smoked salmon and horseradish cream, as well as a homemade spicy apple chutney. I got inspired to try them after seeing the beautiful spread in the December issue of Gourmet. I have to say, for a 'shiksa' (is that the correct spelling?) I make a pretty damn good latke. I have become quite fond of embracing my non-Jewish Jewish side and for two years now I've made latkes for the family so we can say we celebrated Hanukkah, even though the Catholic girl is the only one who really gets into the tradition. What can I say? I love food traditions revolving around holidays --religious or otherwise-- and any excuse is a good excuse to throw a dinner party. Preheat oven to 350. Blend together butters, sugar, vanilla and 3/4 t salt in a bowl. Stir in flour and nuts (dough will be sticky). Form level tablespoons of dough, or use a cookie or ice cream scoop, into balls (40 total) and arrange 2 in. apart on 2 large, ungreased baking sheets. Flatten balls to 1/3 in thick with the back of a water glass dipped in flour. Bake, until edges are golden about 20 minutes. Cool completely. Spoon 1 tsp jam into flat sides of 20 cookies, then sandwich with remaining cookies.